With the onset of March 2016, two highly anticipated new launch residential developments were launched for sale and received commendable response from buyers. The developers of Cairnhill Nine and The Wisteria enjoyed a moment of preliminary success having sold a significant number of units within less than a week of their release for sale. CapitaLand’s Cairnhill Nine, a residential development comprising 268 units, sold a whopping 134 units of the 200 units that were released. At the same time, Northern Resi’s The Wisteria sold 116 of the 138 units put up for sale, thus validating the development philosophy that guided its undertaking. Developers looking to keep prices relatively low and affordable. One of the chief reasons for the kind of buyer interest in these properties is the pricing. According to market analysis, these developments are ideally priced to target native clientele as well as foreign nationals. The majority of units sold at Cairnhill Nine were fixed between S$2,200 per square feet and S$2,800 per square feet. The unit sizes range from 591 square feet to 3,864 square feet, with the one-bedroom plus guest house set up being most popular; in fact, 80% of such 90 units have already been sold. 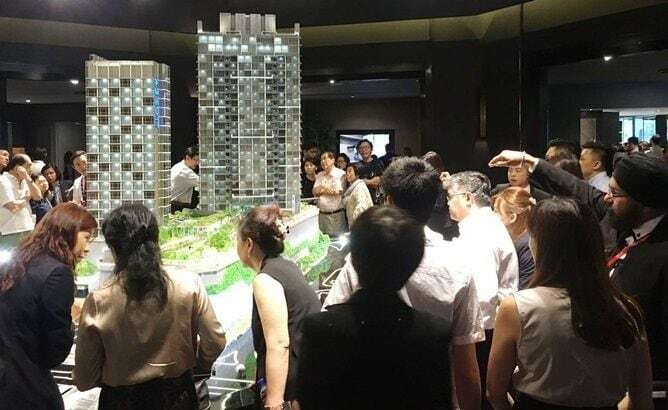 Of the units released at The Wisteria, the average price for one to four bedroom units, ranged from S$1,030 per square feet to S$1,050 per square feet. Initially, 108 of the total 216 units were released for sale, but an overwhelming demand propelled the subsequent release of 30 more units. Finally, 116 units, sized 441 to 1,173 square feet were sold by Northern Resi in just a single weekend. Despite a recent record low of foreigners buying properties in Singapore, by looking at the existing consumer base for these properties, 50% of the buyers at Cairnhill Nine are Singaporeans, whereas the remaining sales accrue to personnel majorly from China, Indonesia as well as Malaysia. CapitaLand now plans to market this property more vociferously in international market by organizing roadshows in major urban centres of south-east Asia. The detailed market analysis for buyers at The Wisteria has yet not been released. Based on the trends apparent so far, it is presumable that the market for fairly priced residences in prime locations such as Orchard and Yishun Town is quite vast. Also, given the dwindling number of new constructions in such regions, buyers are eager to get their hands on upcoming properties, both for investment purposes and to live in the most prestigious locales in Singapore. While a large chunk of the units in both Cairnhill Nine as well as The Wisteria have already been sold, one can expect an upward movement in the price points of the remaining units. Nonetheless, owning property in either residential complex is likely to prove very beneficial in times to come. The property prices in these regions are expected to appreciate in the future, and perhaps anticipating this, buyers have made the most of the opportunity in making purchases during the first round of launches itself. The developers expect the remaining units to have a larger percentage of foreign buyers, but what shall actually happen remains to be seen.